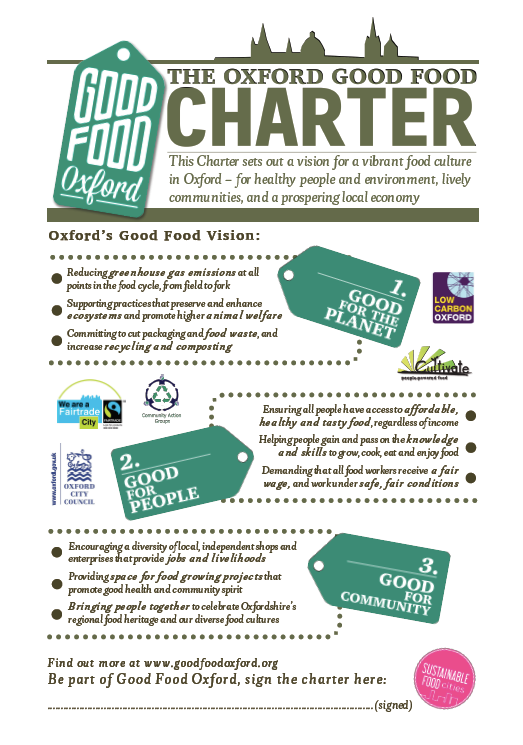 We encourage all new network members to make a pledge to show how they will support the vision of the Oxford Good Food Charter. All current pledges can be viewed below. For a list of all members, including short descriptions of each one, see our list of network members. 18 Anhalt Road – I pledge to produce food locally without ANY fertiliser, pesticides, or other chemicals. I have never used plastic packaging, nor will I. I will attempt to reuse any plastic I use and compost my organic waste. I will be fully transparent. 2 North Parade – To use local suppliers, buy direct from producers and keep waste to an absolute minimum. Abingdon Carbon Cutters – Working with “Choose Abingdon” to promote local food at the Quarterly Local Excellence Markets; Cooking with South Abingdon Children’s Centre’s mother and toddler group: The Hotch Potch Cooks; Running weekly cooking sessions with children from the Caldicott Primary School; Assisting the creation of a Forest Garden at the above school which has an orchard and soft fruit bushes; Loaning out our kit of apple crusher, press and pasteuriser, encouraging better use of our local apple crop, including all those windfalls; Support Good Food South Oxfordshire Project Development Workshop Earth Trust and South Oxfordshire Sustainability (SOS) Food Project; Publish a weekly delicious vegetarian recipe. 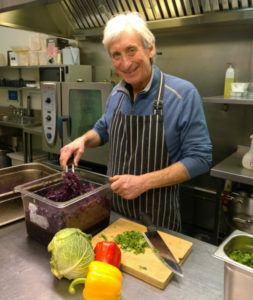 Affordable Oxford – Connecting more volunteers to food projects. Bothy Vineyard – To liaise with others that have signed up to the charter to celebrate the diversity of the local food heritage. Campaign for Real Farming – More people in Oxford supporting local farmers and local food production. Catermasters (OUP) – Aim to use local produce. Catermasters (Oxfam) – We are the caterer at Oxfam and together we are producing a plan of events working towards a better food system. We pride ourselves on supporting local producers and seeking local produce. Working in this way also reduces food miles and supports local businesses. Charlbury Green Hub – Enthuse people to eat local apples rather than let them go to waste – we pick apples locally and give them away throughout the autumn, we also make the windfalls into Sharecroppers Gold cider for sale at local beer festival and other events to raise money for charities. Charlton House – To continually strive to purchase cost effective, ethical & sustainable foodstuffs throughout our Oxford Outlets. Chocsford – Buy local where possible. CSA network UK – By helping to directly involve communities in supporting their local farmer’s by helping to share the risks and rewards of food production. Cultivate Oxfordshire – Grow more, cook more, eat organic. Donnington Doorstep Family Centre – At Donnington Doorstep we would love to achieve a no waste way ethos running through out our whole Centre. This would be throughout the Drop In, Preschool and Youth Place. Teaching the community that all food and produce can be used for many different reasons other than to make meals. We aim to use a lot of left over produce in our messy play/mud kitchen and garden patch. Earth Events (Oxford Vegan Market) – We will use our events to help people understand how their diet affects the environment and help them transition to a more sustainable and healthy lifestyle. Earth Trust – Support new entrants to farming through FarmStep. Fair Food Forager – We pledge to recruit more businesses to be listed on our app, and promote the good food venues in Oxford on our social media channels. FAI Farms – I commit to purchasing higher welfare animal products and supporting producers delivering sustainable improvements to their production systems. Fairfull – At Fairfull we are committed to bringing people together from within our communities and around the world to celebrate our diverse food heritage and culture. We also strive to make our products the very best they can be for both people and planet – we are committed to cutting packaging and using recyclable / compostable materials, and making our food natural and wholesome, avoiding all artificial ingredients and GMOs. Feeding the Gaps – To continue working on food equity and food waste projects. Field & Fork – We pledge to educate our visitors about what producing good food entails, introduce them to seasonal, sustainable ingredients and show them how best to enjoy them every day. Fit2Cook Food Education – To encourage young people to engage with local food and understand why it’s important to buy local and support their local food producers and farmers. Food for Charities – Work on setting up another community fridge in Oxford. Garden Organic – Campaigning to get more food grown organically, especially in cities. 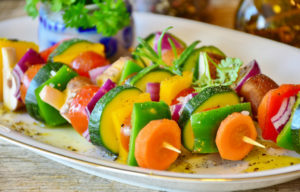 Halo Nutrition – Demonstrate how easy it is to eat at least five portions of vegetables every day. Hempen – Co-operatively grown local organic hemp for a better food system! Incredible Edible Oxford – We pledge to produce 5 different fruits, veg and herbs in our public forest garden in 2019 and 10 of each in 2020, free to anyone who wants to help themselves. We offer 2 free spaces on all of our growing and cooking courses which run throughout the year and across Oxfordshire. We aim to create a minimum of one new edible garden space each year in Oxfordshire. Jam Factory – We will improve our already popular concept to reduce unnecessary takeaway containers by offering a discount to take-away coffees who bring their own cup. We do not us paper cups at all. Jericho Kitchen Cookery School – Sourcing local and eating seasonal foods as much as possible! LAM Brewing – Local crafted production, small batches of beer, focused on local people. LCMB Building Performance Ltd – We will continue to support their clients buildings work harder, their facilities, buildings and estates to more effectively support and deliver their organisations aims and strategy. Our approach ensures our clients’ buildings work harder, improving their return on investment by improving their customer service, making their people more productive, reducing operational cost and energy use. Low Carbon Hub – Put together an office food policy which ensures that, where possible, our food sourcing adheres to the GFO Charter. Manor Farm, Hampton Gay – We want to make all our customers local customers. And we want to educate people about soil health and why grassfed meat is critical to our health and soil health. Mrs Bun the Baker – To continue to ensure food waste is composted, and all packaging is recycled; To keep teaching others on healthy food, doing sugar free baking and working with community groups and schools such as soha housing and childrens centres to look at healthy, affordable cooking. Working with the community to bring cooking to all. Continue my efforts to get primary schools cooking up a storm in the classroom, with my hobless cooking. Mrs B’s Cookery Classes – Reduce food waste, promote recycling and composting, create, affordable recipes, develop cookery skills. North Parade Market – Working towards better availability of locally produced quality food. Ogglio – We work with local producers, sell directly to the consumers, and provide a 100% natural product that’s also sustainable, being small batch. OLIO – We pledge to make sharing food person to person an everyday occurrence. Oxford Chelt Wine School – Oxford Chelt Wine school likes to work with local food artisans and encourages quality not quantity in wine-tasting. OxGrow – OxGrow will continue to educate and empower various communities to grow their own produce. Old Swan & Minster Mill – Regular use of our home grown produce from out kitchen gardens (fruit, vegetables, herbs); Supporting local artisan suppliers when possible; New seasonal dishes on the menus; Improving our waste recycling inc food waste; Future actions include: Helping promote our local food heros to our diners through foodie events at the Old Swan. Organic Deli Cafe – All our disposables are made from plants. Oxford City Farm – Support more people to take part in the production of and have access to affordable fresh local food. Oxford Food Bank – The Oxford Food Bank collects fresh unsold food from supermarkets, wholesalers and food producers, diverting up to 450 tons of good quality fruit, vegetables, dairy and bakery from going to waste each year; it delivers it for free to over 80 other charities and community groups, enabling them to save money and provide nutritious meals for their clients. Oxford Garden Farms – Oxford Garden Farms use no single use plastics, farms using organic methods, delivers within a mile of our land and delivers on the day of harvest by bike reducing food miles to food metres! 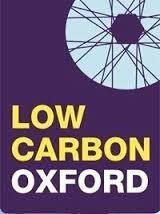 Oxford Hub – To encourage staff recycle more and generally make more sustainable/ethical choices. Oxford Mushroom Co. – In the future we aim to become fully off grid by utilising a rain water harvesting system for a watering needs and solar panels/wind turbine for electric. Oxfordshire Green Party – Our pledges to improve Oxford’s food system include a push for growth in home grown food by developing community gardens, sale and production of local food, and enhancing allotments, as we are aware that food will become increasingly costly in family budgets. We are supporters of Oxford Food Bank and we are working hard to make the Council aware of the effects that local welfare cuts are having to the citizens of Oxford. Pedal & Post – Begin to tackle the heavy/light goods vehicles in Oxford with bike delivery! Reduce air pollution (Co2 & No2), congestion (Inc Parking problems) and be more cost effective vs a van! Plunkett Foundation – To continue to support community food enterprises across the UK and promote the benefits of co-operation as a way of solving challenges in rural areas. Printers’ House, OUP – To reduce food miles and honour English seasonality. Proper Food – Donate to the Oxford Food Bank regularly. Refill Oxford – To make refilling your water bottle easier for all. Relish – Promote the benefits of vegetarian cooking and creating more meals from leftovers. Responsible Hospitality Partnership – Our commitment to the Oxford Good Food Charter is to: Work with partner organisations to improve awareness of issues around food security; Work towards creating a culture of waste reduction; Promote ethical food values through marketing, PR and other activities. Sandford Bakery – My mission is to make bread available to everyone of the highest standard like the ones made at the high end hotels/Michelin star restaurants. To put star quality bread within the reach of everyone. SESI Food and Households Refill LLP – We refill your reusable containers with real food and local detergents to cut all kind of waste. Thali – We believe that businesses must lead by their values, not just for profit. We have a long-term commitment to sourcing local, seasonal and high welfare produce and pledge to keep doing this to help create a better food system. Thames Valley Farmers Market Cooperative Ltd – Enable local food producers to sell their goods at professionally managed, well promoted markets. To safeguard our standards, all applicants should be local and are only permitted to sell produce that they have grown, reared, caught, brewed, pickled, baked, smoked or processed themselves. The Big Lunch – The Big Lunch pledges to continue to make the model of sharing food with neighbours more accessible for a wider range of people and communities. By supporting people to come together across Oxfordshire, the increase in social capital, community connections and localised resilience will help to make sure that people can share access to food, share knowledge and skills and celebrating our diverse food cultures. The Nature Effect – To teach children through practical experience about the source of food and every stage of food production – wheat to flour, flour to bread, or plant and grow vegetables, chop wood, make a fire and cook a soup and work towards embedding this approach into mainstream education. The Deli at No.5 – Carry on supporting our own producers in the UK. The Hayfield Deli – Organic goods and supporting local farmers and suppliers. The Oxford and District Federation of Allotment Associations – We will work with our members on our primary task of managing land as well and sustainably as possible to grow food. 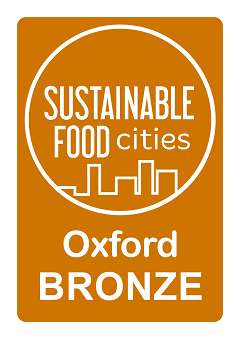 The Oxford Food Company – We are constantly working towards achieving zero food waste, and this will continue. We also pledge to make further progress in restricting our purchasing of fresh ingredients to those that do not come with excessive packaging materials. The Market Garden – Grow as much delicious fruit and veg using organic principles as possible on our market garden in Long Hanborough to sell to our lovely customers in Eynsham. The School Lunch Company – We are already working towards a better food system but pledge to improve more. The Shotover Brewing Company Ltd – We seek to eliminate waste and reduce beer miles. The Wonky Food Company – Grow our business so we can make use of more imperfect and surplus fruit and veg as well as educate consumers about food waste. Tiddly Pommes – Increase production, to make use of a greater proportion of local fruit that otherwise will go to waste. Tolhurst Organic Partnership CIC – Growing and distributing healthy organic and seasonal veg to the Oxford community. Too Good To Go – We pledge to save as much food from being wasted as possible! Transition Chipping Norton – Try to source as much of my food as possible from sustainable sources, support local sustainable producers, help develop a local CSA – Chadlington Kitchen Garden, try to promote healthy sustainable food where practicable through Transition Chipping Norton outreach activities. Transition Eynsham Area (GreenTEA) – To encourage people to grow their own food and to buy locally grown food. Trax – TRAX will Pledge to continue to use the Oxfordshire Food Banks and seek additional sources of sustainable, local produce. Turl Street Kitchen – Our pledge is to increase no. of veggie/vegan dishes on menu. Two Jolly Cooks – Offer good quality foods, using non plastic containers. Waste2Taste – To help people gain knowledge and experience trough training and mentoring, passing on to their peers related to cooking, eating and enjoying food together. If possible growing the food themselves and being more aware of seasonal produce. Promoting good health and community spirit, bringing people together to celebrate diverse food and their own cultures, sharing recipes and knowledge. Providing healthy, nutritious and affordable food, always with an ethical and sustainable approach…The ultimate goal would be to have a never waste anything approach. “We want to feed Bellies, not bins”. What Chloe Cooked Next – I’ll be using locally sourced ingredients, popping up at Farmers Markets and various locations in Oxford. Wild Honey – We are committed to providing the healthiest – both for the consumer and the environment – food choices that are available and keeping our prices as affordable as possible as an essential tenet of our commitment to providing the healthiest food available to our community.